Finally... a pair of parallettes that looks beautiful, is non-slip, and works great. Most parallettes on the market are clumsy and ugly. 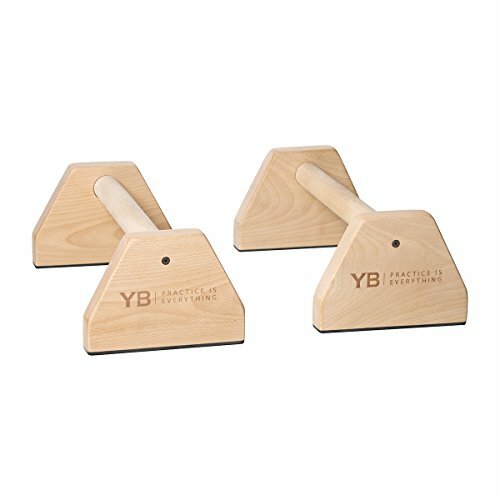 YOGABODY's birch parallettes look amazing, work great, and have a special anti-slip rubber coating for stability in precarious exercises like arm balances, handstand pushups, pike presses and more. Includes: 2 parallettes with full parts warranty. Common uses for YOGABODY Paralettes include: L-sits, tuck sit, V-sit, tuck planche, planche, straddle press handstands, handstand pushups, dips, pushups, swings, lolasana, jump backs, jump through's, bakasana, handstands, press handstand, pike press, puppy press. YOGABODY is an independent yoga education and products company owned and operated by career yoga teachers. We make great stuff, and stand behind our products unconditionally. Build Grip & Upper Body Strength. Stabilize your wrists, shoulders, and elbows. Build functional strength that translates into most yoga classes, gymnastics, movement practices, and functional fitness. Beautiful & Great Hand Feel. Made of beautiful birch wood, polished smooth and strong. Looks great, works great, a beautiful addition to any studios, exercise room, yoga studio or gym. Non-slip. Industrial-grade, non-slip rubber bottoms keep your safe in all poses including inversions, handstand press-ups, and more. Works indoors and outdoors on nearly all surfaces. Great Yoga & Gymnastics Training: L-sits, tuck sit, V-sit, tuck planche, planche, straddle press handstands, handstand pushups, dips, pushups, swings, lolasana, jump backs, jump through's, bakasana, handstands, press handstand, pike press, puppy press. Specs. 5.3 inch (13.4 cm) height x 15 inch (38 cm) long. Bar is 1.5 in (38 mm) diameter. Rubber base 0.016 inch (0.4 mm) thick. Weight per 2-pack: 5 lbs. Made of beautiful birch wood with rubber, non-slip bottoms.